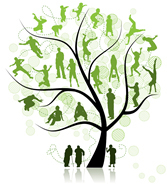 July is National Family Reunion Month. Family is important in our lives; what they mean to us, what they do for us and how they are there for us in tough times. Most of our clients have limited family or no family to provide this support. The summer is a great time for family reunions, getting together to celebrate holidays like the 4th of July or just a vacation to visit the parent or sibling we do not see that often. As you venture out over the summer - with camera in hand – take a picture as a remembrance to cherish those family moments. Think about MonarchCare’s clients who hold onto those memories of days gone by, family who have come and gone, and now rely on us as their family! 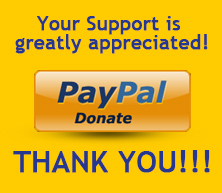 Your donations and referrals help us to continue this mission. 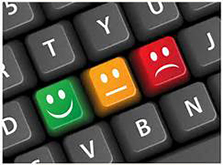 We help our clients enhance family relationships by bridging any gaps that deter their communication. For clients whose families are out of town, we can be their eyes and ears to see how mom or dad is doing at home or in a retirement community. We can stop by to visit, set up a Skype visit or go to a doctor’s appointment perhaps as their advocate. Watch for our new “Family Link” program, soon to be offered at select retirement communities, enhancing their services to residents living in independent or assisted living. This program offers a special care management visit package to encourage that communication and ensure the resident has an advocate at all times. For more information, please contact Chris Levine. Recently we received a grant for $500 from the SHAPE program at Blanche Ely High School. This program is designed to educate, engage and empower high school students through philanthropic activities such as fundraising, community service and advocacy, leadership opportunities and career development. The SHAPE grant will be used to directly support our indigent clients offsetting costs for services like transportation, medical co-payments, food or any other emergency needs that arise. To learn more about this program go to www.shapestudents.org. We applaud these students for recognizing the needs of our clients and thank them for choosing us as their recipient this year. In some families, reunions are a regular, perhaps even annual, event designed to help relatives keep in touch. Other families may gather more spontaneously for other purposes. 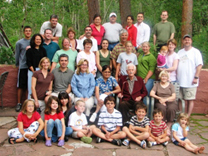 Regardless of the reason, a family reunion differs from a family holiday gathering in that extended family members are present. You can learn a lot about your family at a reunion, gather family history, trace your ancestry and perhaps mend bonds that had been broken. In any case, a family reunion is often a memorable event. USA Today’s Travel Tips offers more information on connecting with your larger family. 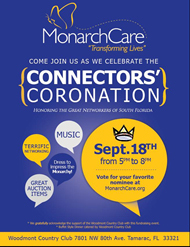 It’s time to recognize great connectors at our annual Connectors’ Coronation, which will be held on Thursday, September 18th from 5:00 – 8:00PM at the Woodmont Country Club in Tamarac. Voting will start on August 13th and end on September 14th. You can vote once a day for someone in each category. Marcia Pinck of the Mental Health Association of Southeast Florida had this to say, “MonarchCare's Connector's Coronation 2013 provided a wonderful opportunity for all the networkers to socialize with their current contacts AND make new connections. There were fun festivities, fantastic food and fabulous friends. You won’t want to miss the 2014 event on Sep 18th”. 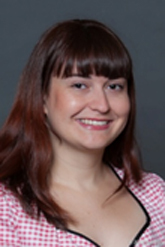 Stefanie joined MonarchCare in February of this year. She started her work career at Target as a cashier, and moved on to an administrative assistant role at an environmental company. She then moved out of the area and worked in retail sales at a major retailer. After moving back to Fort Lauderdale, Stefanie landed a job as a bartender at a local lounge. When asked to volunteer at MonarchCare to assist with auditing files, Stefanie jumped right in. As someone who has always wanted to make a difference in the community but didn’t have the means to do so, she has found a home here with MonarchCare. Linda Wolonick - Expert Business Solutions, Inc.